In the previous two postings (here and here) on the above topic, we addressed why disclosures relating to inventions, for which patent applications have not yet been filed, should only be made on a confidential basis. The last posting ended with an observation that confidentiality agreements or nondisclosure agreements — NDAs — can be much more extensive than simply prohibiting the disclosure of information. This post explores examples of further restraints that can be included by lawyers who prepare NDA documents. This document is a concise summary of how this large corporation requires its employees to handle confidential information. Two aspects of confidentiality agreements are addressed: 1) protecting the special trade information that is advantageous to 3M in the competitive marketplace and 2) engaging in commitments to maintain the confidentiality of information received from third parties. Every business manager should carefully review this document for what it teaches. It has been professionally prepared. (iv) required to be disclosed by law, statute or regulation, provided, that wherever practical Firm shall provide 3M with prior notice of such required disclosure and an opportunity to attempt to limit such disclosure. 2) use the Confidential Information only for the purpose of doing business with 3M. 3M shall be entitled to injunctive relief to enforce Firm’s compliance with the obligations contained in paragraph 3.1 hereof, it being understood and agreed that 3M will not have an adequate remedy at law if such obligations are not complied with. This clause is useful as indicating how short a confidentiality agreement, or rather language imposing a confidentiality obligation on a third-party, can be. In many respects, this agreement is fair and well balanced. It starts out by defining “confidential information” as being “information specifically designated by 3M as confidential.” The implication is that such a designation will be communicated to the contractor at the time of disclosure. Under this interpretation, such a clause is particularly well balanced since many confidentiality agreements do not clarify what information is to be treated as being confidential. This leaves the third-party in the ambiguous situation that perhaps anything they are being told must be treated as confidentiality. For example, where a company disposes of toxic waste. In this case, such an ambiguity will not arise; 3M must designate to the third-party when information is to be treated as being confidential. This would usually be done by way of a verbal statement at a meeting or by way of documents that are labeled “confidential.” This aspect of the confidentiality obligation is very fair and well balanced. Other features of this overall clause that are fair and well balanced are the four exclusions from “confidential information” identified in the subparagraphs i) through iv). Developed over the past 50 years, these exceptions are now standard in the marketplace. These clauses actually refine the meaning of “confidential information” and excuse or remove from the definition items covered by subparagraphs i) through iv). A quick reading of these clauses will explain why they are appropriate. This clause goes beyond the duty of confidentiality. It has real ramifications for anyone agreeing to such terms. Often it is presented in the negative, e.g. 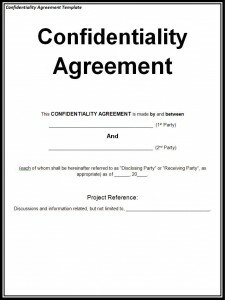 “The undersigned party agrees not to use any information confidential information disclosed without receiving permission from the Owner.” Stated in either the affirmative 3M format or in the negative, the receiving party that agrees to such an obligation will find out that its entitlement to use any inventions that it makes in the course of its relationship with the party disclosing the confidential information will be sterilized. Effectively, it is a non-competition clause. From the viewpoint of the owner of the confidential information, such a clause deals with one of the most difficult issues arising under patent law with respect to the disclosure of inventions between parties. 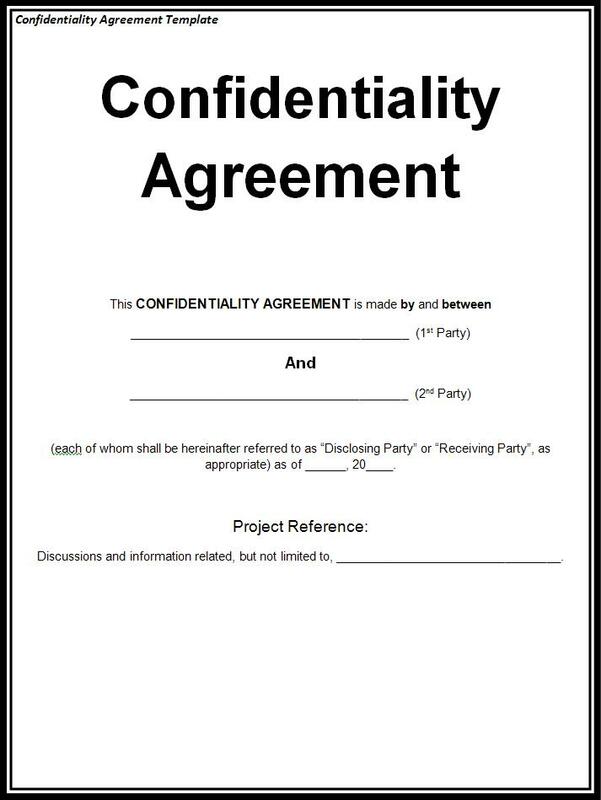 A simple obligation of confidentiality protects the patent rights of the disclosing party. But it only protects the rights of the disclosing party in so far as the disclosing party has conceived and disclosed new ideas that they have created. An unresolved issue in the marketplace around the world is the orderly treatment of improvements conceived by the person who receives confidential information. Now the person who disclosed the original confidential information has a problem. The recipient of the information has made a valuable improvement invention. As an inventor, they would normally be entitled to file an application to obtain a patent on the improvement. Worse, the discloser of the information, having been told of this idea by the recipient, is now barred from ever qualifying as an inventor of such information themselves. This disqualifies the discloser of the information from ever seeking a patent on the improvement themselves. They can’t file for a patent for anything for which they’re not an inventor. Having been told the idea, they can never be an inventor. There is no standard procedure for dealing with this type of situation in the intellectual property legal universe. It could be addressed if both parties sat down and worked out who’s going to own what before they have their confidential discussions and exchanges. But this is generally not done; indeed, it is virtually never done. This type of situation is too difficult a topic to address as part of preliminary exchanges and lawyers have not yet worked out the language to deal with this issue. However, the above 3M agreement adds subparagraph 2) which goes beyond the issue of a mere duty of confidentiality. By stipulating that the recipient of information will “use the Confidential Information only for the purpose of doing business with 3M,” this clause impairs the ability of the information recipient from filing for a patent on any ideas that they generate arising out of the disclosure of the confidential information. They could still file for patent protection with the consent of 3M and the parties may agree as to terms of ownership over any resulting patent. Accordingly, 3M acquires negotiation leverage through inclusion of subclause 2) in its NDA agreements. This is a lawyer’s compromise that is an alternative to totally resolving the consequences of confidential information being used by third parties to make further inventions. This is not a far-fetched scenario. Corporations subcontract projects all the time to engineering firms that are mandated to solve problems that the corporations have encountered. Such subcontractors often conceive of solutions that are novel and valuable. If not otherwise constrained, they will want to use such solutions to serve the needs of other companies. Sometimes doing so would disclose the confidential information of the original idea. That would be prohibited by a minimal NDA. But in other cases, exploiting an innovative solution need not disclose original confidential information. Or alternately, the duty of confidentiality in the original information may expire by reason of one of the events i) through iv) listed above. So the scope of the NDA is extended by clause 2) to further limit the freedom of the information recipient. Accordingly, this is one important example of how documents labeled as addressing issues of “confidentiality” can go beyond the simple issue of keeping things secret. Lawyers have added numerous other clauses to these types of agreements. In the 3M example above, the concluding statement has been added to facilitate obtaining an immediate interlocutory injunction before the Courts in the event that the disclosure of confidential information has been threatened or initiated. Obtaining such an order will stop the further release of confidential information even before there has been a trial. This is something that the disclosers of confidential information would greatly appreciate since trials sometimes don’t occur for several years. Without a pre-trial interlocutory injunction, restraining further initiatives by a person alleged to be breaching a confidentiality agreement, the damage of an unauthorized disclosure that is not stopped promptly could be much more extensive than if stopped immediately. This is just one example of an additional obligation imposed on an information-recipient that goes beyond merely imposing a duty of confidentiality. In this case, the information recipient is agreeing to waive the right to have the freedom to use information addressed by the normal trial process. In conclusion, the message is always the same: Read carefully and understand fully what you’re agreeing to whenever you sign a document.